America is facing an epidemic. As of 2014, more than 1.56 million people were incarcerated in the United States. The people serving their time – the fathers, mothers, sisters, brothers, sons, and daughters – hail from many different areas, and they were locked up for varying reasons: drug-related offenses, robbery, domestic violence, assault with a deadly weapon, and many more. But the U.S. is a big place – and we wanted to explore the prisoner population breakdown by state. To accomplish this, we gathered data from the Bureau of Justice Statistics Corrections Statistical Analysis Tool (CSAT) and mapped each state’s prisoner population by jurisdiction. But these maps have a twist: We redrew state borders to create cartograms that reflect the size of each state directly proportional to its per capita rate of prisoner population by jurisdiction. The basic shape of each state remains the same, but states with high proportions of inmates become much larger, and states with lower proportions become smaller. We also zoomed in on specific prison populations: female prisoners, male prisoners, and those serving sentences of more than one year. Read on to see a startling snapshot of who’s serving time in America’s prisons. For most of us, the U.S. map has been familiar sight since childhood; we can trace each state’s borders by memory. Redrawing the boundaries to reflect prisoner population of each state – based on jurisdiction rather than physical location – produces an eye-opening visualization of the country’s prison epidemic in various regions. It’s easy to see at a glance that many states in the South, along with parts of the Northeast and Midwest, are home to more than their share of prisoners. Louisiana grows larger, as does Delaware and Oklahoma. From 1980 until today, the number of inmates in this country has more than quadrupled. The map above chronicles the changing landscape of America’s prison population across the country from 1980 to today. In 1980, the majority of states had a prisoner population of fewer than 200 prisoners per 100,000 residents. 1985 shows some increases: Alaska’s number of prisoners per residents more than doubled (from 203 per 100,000 to 437) Nevada, too, saw a marked increase, jumping from 227 inmates per 100,000 to 397. Many states’ prisoner population proportions steadily increased in the late 1980s and early 1990s; by 1995, the prisoner population numbers in the South exploded. Many states in the West and Midwest showed increases by 2000 and 2005, but growth appeared to even out after that. Comparing the 2010 map with today shows perhaps the least dramatic change overall. In fact, some states’ percentages of prisoner populations decreased during that time: Mississippi dropped from 709 prisoners per 100,000 to 628; Colorado fell from 452 to 385; and Texas lessened from 688 to 616. 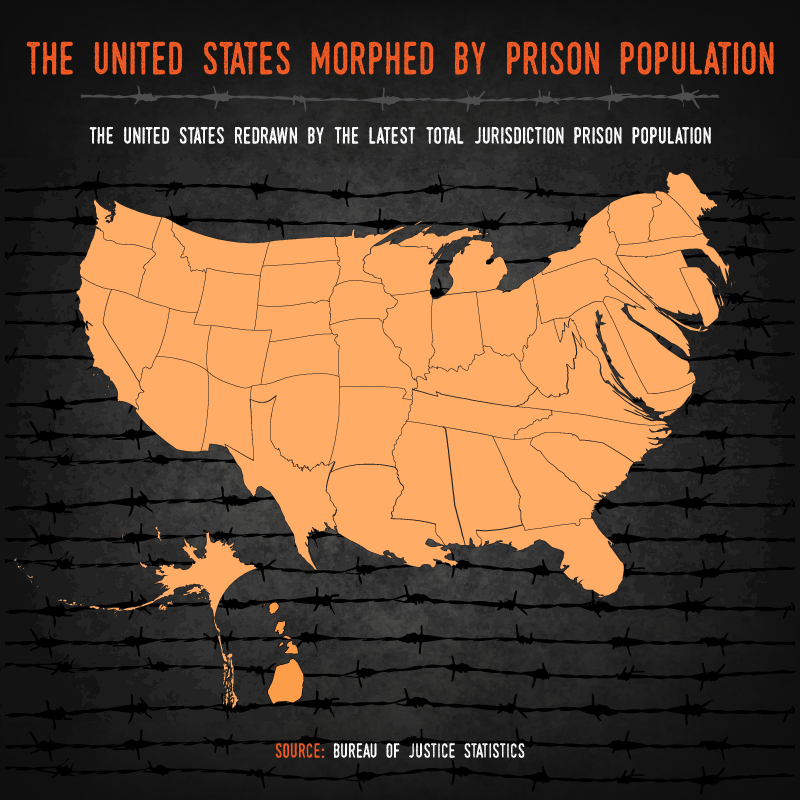 This new map, which was redrawn to represent prisoner populations in each state, is a startling caricature of the United States. Overall, much of the South, Northeast, and Midwest bloat beyond recognition, while the West shrinks. In the East, Delaware and Connecticut dominate, and in the South, Louisiana rivals (the real) Texas in size. In the West, Arizona and Idaho fill out, and California becomes a sliver of its former self. Far fewer women are incarcerated than men in this country. As of 2014, nearly 113,000 women were serving sentences compared with almost 1,449,000 men. However, the issue of women in prison is a serious one. Female prisoners are much less likely than men to be incarcerated for violent crimes, and they are significantly more likely to struggle with mental health issues than male inmates. The map above changes based on each state’s female prison population. As you can see, California shrinks in size due its smaller female prison population, while Connecticut expands. Between 1980 and 2014, the number of women in prison grew by more than 700% – from slightly over 25,000 in 1980 to more than 215,000 in 2014. Although fewer women than men are locked up overall, the rate of growth at which women are incarcerated outpaces that of men. The above GIF visualizes the female prisoner population between 1980 and 2014. A low percentage of women were incarcerated in 1980 – fewer than 20 per 100,000 residents in most states. By 1985, many Southern states experienced increases, but the most dramatic belonged to Alaska (in which the prisoner-to-resident ratio quadrupled) and Nevada (in which it more than doubled). In many states, the percentage of women in prison continued to climb steadily over the next couple of decades. By 2000, Alaska had 94 female inmates for every 100,000 residents; the number rose to 185 by 2014. Over the same period, Idaho’s moved from 76 to 127. However, Texas’s 129 in 2000 dropped to 106 in 2014. The U.S. map redrawn to represent states’ female inmate population is less dramatic than the map representing both genders; however, it’s still a marked difference from the standard map. Delaware grows to many times its actual size. Texas diminishes, while Oklahoma expands. In the West, Idaho and Arizona thicken considerably, while California thins out. As mentioned above, the vast majority of incarcerated Americans are men. Louisiana has the highest percentage of male inmates, so the state grows in size in our morph. Delaware comes in second and becomes larger in size than the state of New York. The GIF above illustrates the changing landscape of the male inmate population between 1980 and 2014. In 1980, the U.S. was home to 316,401 male inmates. By 2014, that number had grown to 1,448,564 – an increase of nearly 358%. 1990 saw some states with fewer than 200 inmates per 100,000 residents. Just five years later, increases occurred in many states, especially in the South. Additionally, Texas’s male prisoners to population more than doubled. By the end of the year 2000, Louisiana had 1,525 male inmates per 100,000 people, Texas had 1,472, Oklahoma had 1,225, and Alaska had nearly 1,200. By 2010, Arizona had jumped to 1,146. By 2014, some states had peaked, while others decreased. Between 2010 and 2014, Utah lessened from 445 to 430, Washington from 500 to 472, and Iowa from 574 to 524. Redrawing the U.S. map using the male prisoner population in each state paints a telling picture. Overall, much of the South, Midwest, and Northeast expand, while the West recedes. States including Louisiana, Connecticut, and Delaware grow dramatically, while Texas shrinks. Next, we looked at each state’s prisoners serving sentences of more than one year per 100,000 residents. Of the 1,561,525 inmates in the U.S., 1,508,636 are serving sentences of more than one year – which represents nearly 97%. Louisiana tops the list for inmates serving hard time, and Oklahoma comes in second. Both states nearly double in size. In 1980, 315,964 inmates in the U.S. were serving sentences of more than one year. By 2014, that had number increased to more than 1.5 million. As the violent crime rate rose in the 1980s, so did the prison population. However, in the early 1990s, when the crime rate decreased, the prisoner population continued to grow. By 1995, many Southern states topped a rate of 400 prisoners to 100,000 residents. Texas had 674, Louisiana 575, and Oklahoma 549. By 2000, the rate of growth in one-plus year incarceration slowed, though it still continued on an upward trend. In 2014, Louisiana had 818 inmates serving more than one year per 100,000 residents, Alabama had 634, and Arkansas had 601. Finally, we redrew the U.S. map based on inmates in each state serving sentences longer than one year. The South, Northeast, and Midwest expand, while many states in the West decrease in size. Louisiana, Arkansas, Alabama, and Oklahoma grow dramatically. Why? The South’s relatively high prison population has been attributed to various causes, including mandatory drug sentences, laws for repeat offenders, and rules restricting early release. Racial disparity is a factor as well. The U.S. has a higher incarceration rate than the rest of the world. Though the country is home to only 5% of the world’s population, it contains 25% of the world’s prison population. Various factors have spurred the increase in incarcerated Americans during the past four decades – and it’s not necessarily an increase in crime as one might think. Mass incarceration and the War on Drugs sparked a dramatic rise in the number of people sentenced for minor infractions. Harsh sentencing laws, including mandatory minimum sentences, kept people in prison for longer amounts of time. And a shortage of space in mental institutions has led to increased incarcerations of people who have mental illnesses. The results are troubling: Prisons are overpopulated, families are split up for years – sometimes over minor infractions – and taxpayer costs are skyrocketing. Yet funds for prevention, treatment, and reentry programs are limited. Across the U.S., conversations are occurring about how to fix the issue – from decreasing sentences for nonviolent crimes to tweaking parole revocations. Politicians are tackling the issue, and some states, including Alaska, are spearheading efforts to cut prison population and trim budgets. Can the U.S. really fix the system? That remains to be seen. We redrew the United States based on the per capita population rate of prisoners in each state. To generate the cartograms used here, we employed the services of a cartographer. The cartographer used this tool’s algorithm to produce the cartograms. We used the Bureau of Justice Statistics Corrections Statistical Analysis Tool (CSAT) – Prisoners to find the per 100,000 resident rates for prison population numbers by jurisdiction, including the numbers for male and female populations as well as for inmates serving more than one year’s sentence. We grant permission to share the images found on this page freely. This guide is provided by Aizman Law Firm.